Habitat for Humanity of Sangamon County (HFHSC) has kicked off its 1st annual 1,000 Women Strong-Habitat Sangamon. Habitat is seeking 1,000 women to donate $100 each. The goal of $100,000 is the amount required for resources to construct each Habitat home. Once funding is secured, these women will then build a Habitat home together. Habitat aims to collect all donations by August 31, in order to build come fall. 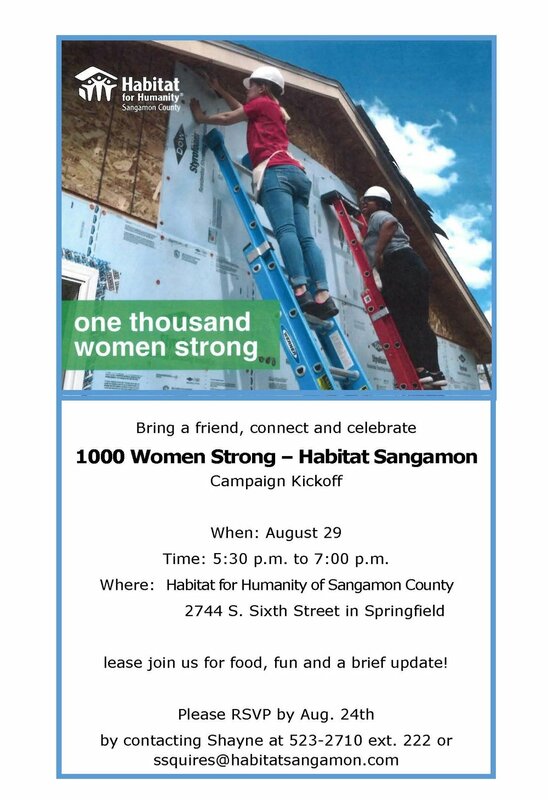 The 1,000 Women Strong-Habitat Sangamon campaign will kick off on August 29 from 5.30pm to 7pm at Habitat for Humanity of Sangamon County. Members of the public are invited to bring a friend for food, fun, and information about the campaign. Contact Shayne Squires at (217) 523-2710 ext. 222 or email ssquires@habitatsangamon.com to confirm attendance. To join 1,000 Women Strong-Habitat Sangamon or for information about HFHSC programs, visit Habitat at 2744 S 6th Street or check out habitatsangamon.com. Central Illinois, home for sale, Real Estate Agent, Springfield IL, Tips to sell your homeGemma Long August 24, 2017 Deb Sarsany Team, The Real Estate Group, Inc.